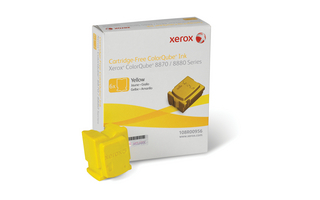 Xerox's proven ColorQube 8870 ink, yellow (6 sticks 17300 pages) for ColorQube 8880 produce brilliant, vibrant prints on a wide range of media with 90% less waste. Xerox Genuine Supplies and Xerox equipment are made for each other. Accept no imitations.